I was always that one fat kid. It became a part of me, an identity. Although I never had problems socializing or fitting in, I just felt that my outer appearance never fit my inner self. I mean, I was always active and played sports as a kid, even though I was on the heavier side. Again, I felt like my weight held me back, just as it did in almost every other aspect of my life. Activities like running, jumping, throwing, and batting were so much more difficult than they should have been. All of this made me feel like I was capable of more. As the years after high school passed, my activity leveled slowed, and the waistline only grew. Before I knew it, the 330-pound 18-year-old was now a 450-pound 25-year-old. Talk about a crushing blow. This was when I seriously started considering weight-loss surgery as an option. In August 2005, I researched gastric bypass surgery, learning the pros, cons, and doctors in the area. Two months later, I had a consult with a bariatric surgeon. It almost felt like a dream. Then on December 20, 2005, I had my surgery. I treat that day like a second birthday, as it was the day I was given the opportunity to start a new life. Everything becomes easier to do when you're 278 pounds lighter. Things I take for granted now were an arduous task before: walking up and down stairs, cleaning, walking my dog—anything that involved physical exertion, including getting off the couch. It took me 23 months to lose 278 pounds. 278! That number still shocks me. It is the equivalent of losing a very large person that used to live on my back. However, weighing 184 pounds and looking like a bag of bones wasn't what I wanted either. It wasn't my goal to lose that much; it just happened, and I actually thought the weight loss wouldn't stop! Shortly after this, I decided I needed to gain some healthy weight. This is what I call my "second transformation," as I went from morbidly obese, to super skinny, to the more athletic build I carry today. There were a couple of failed gym attempts before I took up running. I found a 12-week program for beginners to prep for 5K races. This seemed fun, as I was never able to run more than a mile without wanting to die. I continued to run while getting myself conditioned for the local semipro football that was coming up. The season made me realize how skinny I had gotten, as I spent a lot of the season getting knocked around. A few months after that, I finally got into the gym, and as they say, the rest is history. That was over five years ago and the gym is a huge part of my life and of who I am. I began to see results pretty quickly. I had worked out a lot in my late teens until I was about 21, so it all came back very fast. I became addicted to the gym. More time in the gym meant more sweat, more pain, and more muscle. Each week for the first six months, I gained, busted through plateaus, and grew. I was finally starting to look like the person I knew I was meant to be. Making it to the gym every day was the hard part. I was changing job locations, and sometimes I would be almost an hour away from home. The last thing I wanted to do some days was hit the gym. But I dragged myself in there. It was easy for me to dig deep for motivation when all I had to do was think back to my 462-pound self. I may have had surgery to aid my weight loss, but that's all it is: an aid for weight loss. It is not permanent, but I was determined to make it that way. Now 8-1/2 years later, here I am. I do not consider myself a success, but a work in progress. I have tried a wide array of supplements in the last 5 years, but here is the best combination I have found that has worked for me. My diet changes drastically according to my workout routine, so I will do a rundown based roughly on the average day. Every 12 weeks or so, I set myself a new challenge. I go from bulking, to cutting, or working on speed and endurance. Sometimes I just go easy for a few weeks and let myself recover. I am currently working on a speed and endurance workout program to help me with an upcoming obstacle mud run. "To start is easy, but to continue is the hard part." Between working two jobs and the commute to one of them, it was quite difficult to muster up the strength to get into the gym. People are always using that as an excuse to skip the gym, and I did not want to be one of those people. When people asked how I squeezed in the time when I was working two jobs, I told them, "You know that relaxation time you have in the evenings? That is when." Many days I would wake up, work all day, go to the gym, then sleep. I have been on the same path for quite some time. I would consider my fitness a success just by keeping up with the lifestyle I have now. I will continue to challenge myself, reshape myself, and push myself. I am a Certified Fitness Trainer and Specialist in Fitness Nutrition with my own studio to train clients. I would like to continue to inspire others to help them achieve their goals and grow my business and brand, so I am able to help more people change their lifestyles. Keep at it. To start is easy, but to continue is the hard part. It is going to hurt, wear you out, tire you out, and frustrate the hell out of you at times. If it were easy, it wouldn't be worth doing. There is also never an end to a transformation. Nobody on here is ever done transforming. There is always another challenge, workout, routine, or goal to keep you going. I didn't lose a ton of weight and say, "Wow, look at me now! I consider myself a success." Each milestone I reach and every goal met are a success, but the journey is never over. After the first six months in the gym, my gains really started to slow down, as I knew they would eventually. That's when I decided it was time for a specific program. 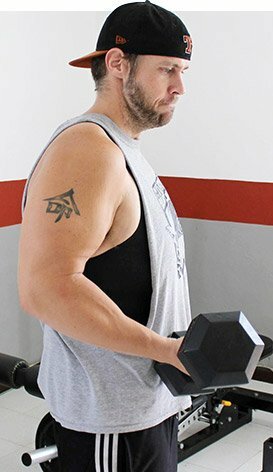 My introduction to Bodybuilding.com came when I searched for a bulking program and stumbled upon Derek Charlebois' 12-Week Bulking Trainer. It really helped me break through my plateaus. I liked it so much that after taking it easy for a few weeks, I restarted the program. Also, seeing other peoples' hard work and progress is a huge motivator. If I get stuck in a routine or I am not hitting a goal, I look to the other people on BodySpace for inspiration. There are people on here who have overcome a lot or can teach a thing or two about humility.